This is an Open Access article distributed under the terms of the Creative Commons Attribution-Non Commercial-No Derivatives License (http://creativecommons.org/licenses/by-nc-nd/4.0/), which permits non-commercial re-use, distribution, and reproduction in any medium, provided the original work is properly cited, and is not altered, transformed, or built upon in any way. We report a case established of Milwaukee shoulder syndrome (apatite-associated destructive arthritis) and describe the bone scintigraphic, radiologic and histologic findings, which are compared with a similar case of rapid noncrystal-deposition arthritis. The cases shall add to the differential diagnosis of shoulder arthropathy on bone scintigraphy. Milwaukee shoulder syndrome is a destructive arthropathy associated with calcium hydroxyapatite and calcium pyrophosphate dehydrate crystal deposition mostly affecting elderly females. We describe the bone scintigraphic pattern observed in a patient with an established diagnosis of Milwaukee shoulder syndrome and in another patient in whom the diagnosis was suspected on the basis of the bone scan appearances. The aim of the report is to introduce this syndrome and document the bone scintigraphic findings for the differential diagnosis of shoulder arthropathy. A basic knowledge of this condition is important in order to recognize the uptake pattern often seen in patients undergoing bone scans with the primary complaint of painful shoulder joints. A 76-year-old lady with chronic renal failure presented with bilateral shoulder pain and swelling without any preceding history of trauma. Her x-rays of the shoulders showed joint narrowing, subchondral sclerosis and subchondral bone destruction, and calcifications in the joint capsule There was bilateral rotator-cuff tear. US of the shoulders showed fluid collection and synovial thickening. Synovial fluid was aspirated which appeared haemorrhagic and positive for calcium apatite crystals. The patient was referred to the nuclear medicine department for a bone scan in Nov 1997. 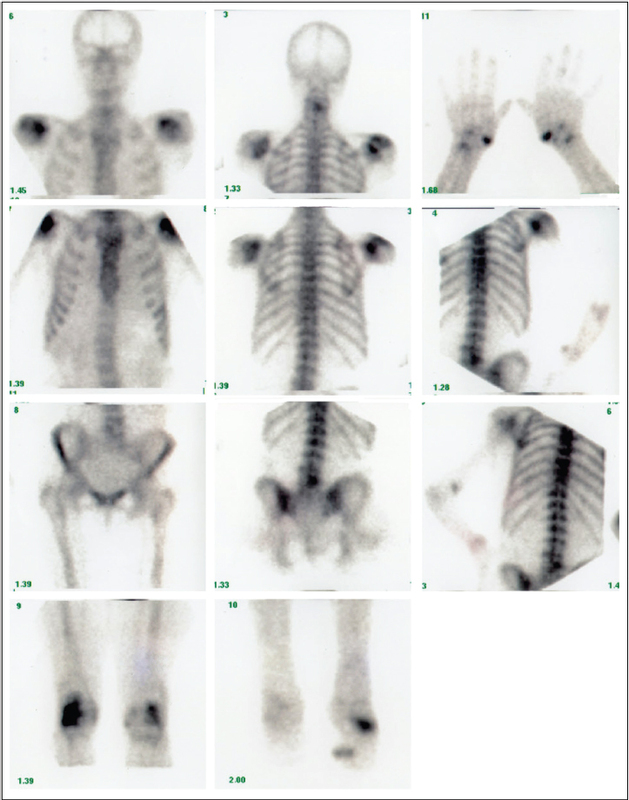 Multiple spot views of the skeletal were obtained to cover the entire skeleton 3 hours after an intravenous injection of 600 MBq 99mTc-methylene diposphonate using a singlehead camera fitted with a low-energy highresolution collimator. The bone scan images (Figure 1) showed a high bone/soft-tissue ratio with poor visualization of the kidneys consistent with the known chronic renal failure. There was intense increased uptake in both shoulder joints as well as the lateral compartment of the right knee. These changes taken together with the x-rays and the synovial fluid microscopy were consistent with Milwaukee shoulder syndrome. There was also increased uptake seen in both 1st carpometacarpal joints and in the left tarsal region and the base of the 1st left toe consistent with arthritis. The changes in the shoulders were thought to be typical of Milwaukee shoulder syndrome and on basis of the increased uptake in the lateral compartment of the right knee, the knee joint was also thought to be involved but wasn’t further investigated. The other joins with active arthropathy were thought to be possibly involved. The patient was treated with colchicine and physiotherapy with symptomatic relief. 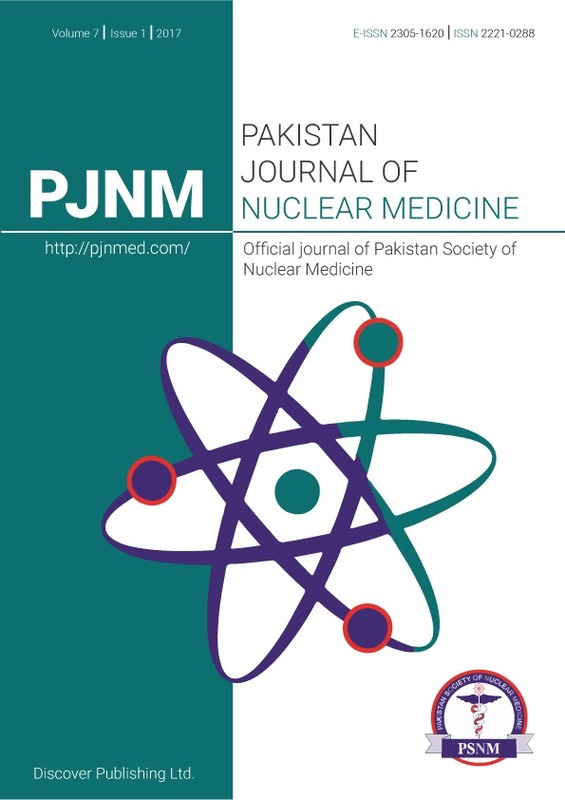 A 97-year-old lady who presented with bilateral chronic shoulder and right hip pain referred to the nuclear medicine department of the Royal Hospital Haslar in Gosport, UK in Sep 2000. X-rays of the shoulders showed joint space narrowing with degenerative changes and joint and peri-articular soft-tissue calcifications. 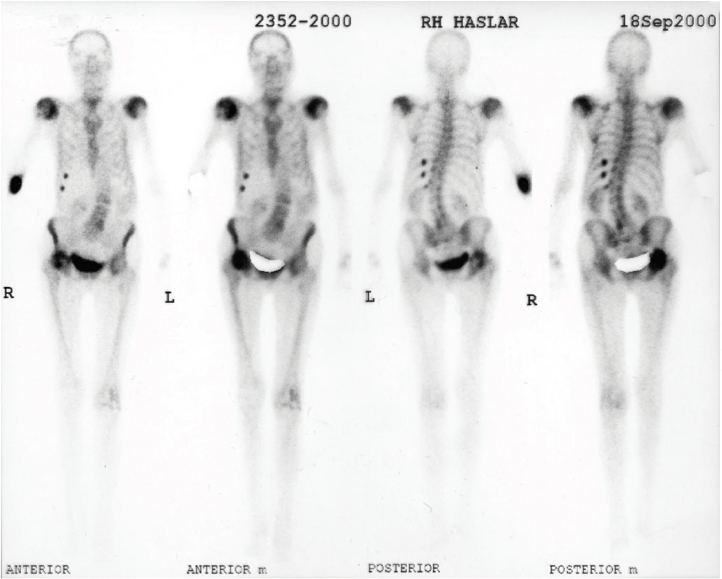 A whole-body bone scan was performed 3 hours after an intravenous injection of 640 MBq 99mTc-methylene diposphonate using a double headed ADAC gamma camera fitted with a low-energy high-resolution collimator. The whole-body bone scan images (Figure 2) showed crescent-shaped areas of intense increased uptake in both shoulders corresponding to the glenohumeral joints. A similar pattern of intense increased uptake was seen in the right hip. There changes were consistent with active destructive arthritis of the bilateral shoulder and the right hip joints. The bone scan also showed scoliosis of the lumbar spine and focal increased uptake in the right 10-12 ribs posteriorly consistent with rib fractures. X-rays of the shoulders showed moderate degenerative changes. The scintigraphic features were very suspicious of Milwaukee shoulder syndrome and the patient was further investigated to establish or exclude the diagnosis. The bilateral large effusions in the shoulder joints were aspirated. The aspirated fluid showed some lymphocytes and macrophages but no crystals were identified. Rheumatoid factor was negative and there was positive ANA with homogenous pattern which was thought to be of doubtful significance. The case was thought to be due to non-specific advanced active arthropathy as a result of failed microscopic diagnosis of Milwaukee shoulder syndrome. Milwaukee shoulder syndrome (MSS) was first reported in 1981 in 4 elderly female patients from the state of Milwaukee in the United States. The term was coined to describe the radiological, clinical and histological features seen in the shoulder joints of these patients with chronic recurrent severe shoulder joint arthritis and joint effusions with x-rays showing rotator cuff tears and severe degenerative joint disease [1-3]. Another report a year later described similar features introducing the term of rapid destructive arthritis of the shoulders for the disease . Further studies introduced other terms for the disease including haemorrhagic shoulder of the elderly, rapid destructive arthritis of the shoulder, apatiteassociated destructive arthritis and idiopathic destructive arthritis of the shoulder, crystal deposition disease, crystal-induced arthritis, etc. . The involved joints show massive effusion, which is characteristically non-inflammatory, haemorrhagic with intraarticular calcium hydroxyapatite deposition that causes release of lysosomal enzymes resulting in destruction of the peri-articular tissue specially the rotator cuff as well as the articular cartilage. The shoulders are the most frequently involved joints but other joints such as the elbows, wrists, hands, hips, knees, and the feet as well as the cervical and lumbar spine can be affected . Elderly age-group patients are mostly affected with a male:female ratio of 1:4 [6-8]. The bone scan shows intense uptake in the affected joints as well in the peri-articular calcific soft-tissue deposits. Both of our cases showed a similar pattern of uptake on the bone scan in the shoulders though the right knee was seen to be involved in Case 1 where the uptake was seen to involve lateral tibiofemoral compartment, which is the reported pattern of knee involvement in Milwaukee shoulderknee syndrome . A somewhat characteristic appearance of crescentic increased activity in the joint cavity as compared with that seen in the articular regions was observed, presumably due to bone crystal uptake in these cases of crystalline arthropathy (Figures 1 & 2). Although bone scintigraphy in these patients is highly sensitive, it appears rather nonspecific with the scintigraphic features similar to those seen in other types of arthritis. The bone scan of the patient in Case 2 showed intense bilateral glenohumeral joint and right hip joint uptake with peak of activity confined to the joint cavity (Figure 2). This uptake pattern was similar to that seen in Case 1, but Despite this, the case was clinically diagnosed and treated as Milwaukee shoulder syndrome. The detection of basic calcium phosphate (BCP) crystals in the synovial fluid of patients with arthropathy is challenging due to the submicroscopic size of BCP, the complex nature of the matrix in which they are found and the fact that other crystals can co-exist with them in cases of mixed pathology . Routine analysis of joint crystals relies almost exclusively on the use of optical microscopy, which has limited applicability for BCP crystal identification due to limited resolution and the inherent subjectivity of the technique . The key mechanisms whereby BCP crystals may cause tissue damage are: (1) the induction of mitogenesis; (2) the upregulation of matrix metalloproteinase (MMP) production; (3) the stimulation of cyclooxygenases 1 and 2 and prostaglandin E2 production; (4) the stimulation of cytokine production, and (5) the induction of nitric oxide production . Factors that may predispose to this syndrome include deposition of calcium pyrophosphate dihydrate crystals, direct trauma or chronic joint overuse, denervation and chronic renal failure . Chronic renal impairment was the predisposing risk factor in Case 1 in this report. The treatment in these cases is supportive and involves resting the affected joint(s), prescription of nonsteroidal anti-inflammatory agents. Refractory cases are suitably treated with substitution of magnesium-containing NSAID and oral chochicine . McCarty DJ, Halverson PB, Carrera GF. Milwaukee shoulder—association of microspheroids containing hydroxyapatite crystals, active collagenase, and neutral protease with rotator cuff defects. I: clinical aspects. Arth Rheumat 1981; 24(3):464–73. Halverson PB, Cheung HS, McCarty DJ. Milwaukee shoulder—association of microspheroids containing hydroxyapatite crystals, active collagenase, and neutral protease with rotator cuff defects. II: synovial fluid studies. Arth Rheumat 1981; 24(3):474–83. Garancis JC, Cheung HS, Halverson PB, McCarty DJ. Milwaukee shoulder—association of microspheroids containing hydroxyapatite crystals, active collagenase, and neutral protease with rotator cuff defects. III: morphologic and biochemical studies of an excised synovium showing chondromatosis. Arth Rheumat 1981; 24(3):484–91. Lequesne M, Fallut M, Coulomb R, et al. L’arthropathie destructrice rapide de l’´epaule. Revue Rhumat 1982; 49:427–37. Neer ICS II, Craig EV, Fukuda H. Cuff-tear arthropathy. Bone Joint Surg 1983; 65(9):1232–1244. Genta MS, Gabay C. Milwaukee shoulder. New Engl J Med 2006; 354(2): article e2. McCarty DJ. Milwaukee shoulder syndrome. Trans Am Clin Climatolog Assoc 1990; 102:271–83. Nguyen VD. Rapid destructive arthritis of the shoulder. Skeletal Radiol. 1996; 25(2):107–12. Halverson PB, Carrera GF, McCarty DJ. Milwaukee shoulder syndrome. Fifteen additional cases and a description of contributing factors. Arch Intern Med 1990; 150(3):677–82. Yavorskyy A, Hernandez-Santana A, McCarthy G, McMahonc G. Detection of calcium phosphate crystals in the joint fluid of patients with osteoarthritis - analytical approaches and challenges. Analyst 2008; 133(3): 302–318. Molloy ES, McCarthy GM. Basic calcium phosphate crystals: pathways to joint degeneration. Curr Opin Rheumatol 2006; 18(2):187–192. Halverson PB1, Carrera GF, McCarty DJ. Milwaukee shoulder syndrome. Fifteen additional cases and a description of contributing factors. Arch Intern Med 1990; 150(3):677–82. Nguyen VD. Rapid destructive arthritis of the shoulder. Skelet Radiol 1996; 25(2):107–12.